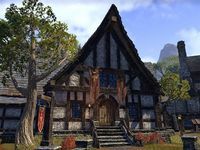 The Fighters Guild in western Evermore is a guildhall housing the local branch of the Fighters Guild. It is a two-story cottage with a big training yard at its southwestern wall. The first floor of the guildhall consists of one large room. On the left-hand side from the main entrance is a desk and a bookshelf. The armsman's stand is opposite the entrance. Several leveled weapons and shields can be found on or near it, freely available. For more pieces of weaponry and armor, be sure to check several weapon stands around the hall and a worktable immediately on the right from the front door. The far left corner of the room is a resting area with chairs, fire pit in the middle and a fireplace which can be used for cooking. The door here is barred. The far right corner has one more table with chairs, a staircase to the upper level and a door which leads to the training yard. The upper floor is a loft with four bunk beds, several trunks and a couple of nightstands. The training yard is equipped with an archery range, three training dummies and a weapon stand. Several guild members can be found here honing their fighting skills. Larhoth appears to supervise the training process from a platform on the right. Behind him there is another weapon stand along with a backpack which can hold provisioning or alchemical ingredients.